Also, since the population of this branch's service area is only about 20,000 people, it is pretty rare for my department to buy more than one copy of anything. We do buy doubles (and sometimes 3-6 copies) of the hugely popular stuff---Harry Potter, Twilight, Diary of a Wimpy Kid, etc. It is unusual for us to have the demand to justify more than one copy of most items, although we are happy when a book catches on and requires it! How do I locate books to be potentially added to my library? Blogs! I am a huge fan of bloggers who write about publisher's preview sessions. One who does this is a lot is fellow Michigan native Elizabeth Bird who blogs at Fuse #8.
Review Journals! I read School Library Journal, Publisher's Weekly, The Horn Book. We also get Library Journal, which I mainly read for the articles and not the reviews. There are many more journals than these worth taking a look at, but these are the ones I have access to at work and home. Patron Requests! I am pretty liberal about buying what patron requests unless it is outside the scope of our department (textbooks, for example) or of extremely questionable quality. Price and availability are also factors. Bestsellers lists! I mainly find in Publisher's Weekly and try to keep an eye on what is selling the most on Amazon.com as well. 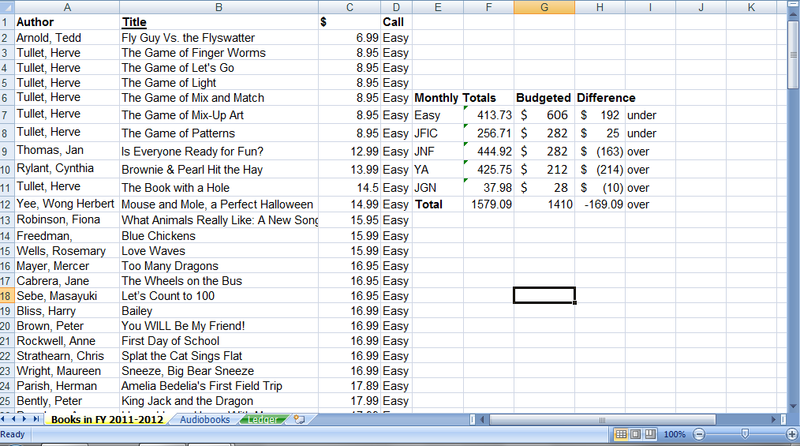 How do I decide how much to allocate to a budget? 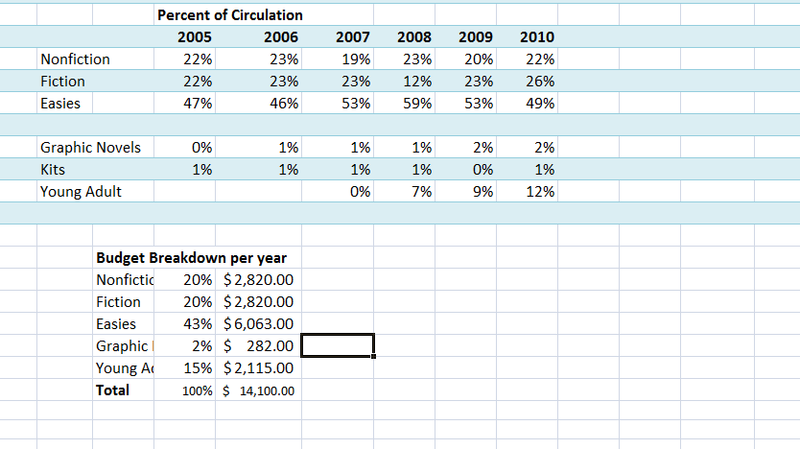 The first group of data is straight circulation numbers from our annual reports. The chunk below that and on the left is percent growth and decline of individual areas. You can see that certain areas of our collection are exploding in popularity and others are declining. These are calculated off the past few years' worth of data to be as current as possible. Growing in interest are the young adult, fiction, and graphic novels, while paperbacks and kits are declining. Actually the reason for the decline of paperbacks is that I stopped circulating them generically and have them cataloged and now they are included in the fiction category. Then I determined what percent of circulation comes from which category. Basically, it can be broken down like this: Nonfiction and fiction combine for about 40-45% of our circulation, picture books are almost exactly 50%, and the rest is primarily young adult with a smattering of graphic novels and readalong kits in there to round it out. I would not be at all surprised to see our young adult circulation contribute much more heavily in the 2011 statistics at year's end. Our collection has been greatly expanded over the past 2-3 years and is going gangbusters. Next I took the approximate amount of circulation per category and determined approximately how much we should be spending (in U.S. dollars) per year in that area. 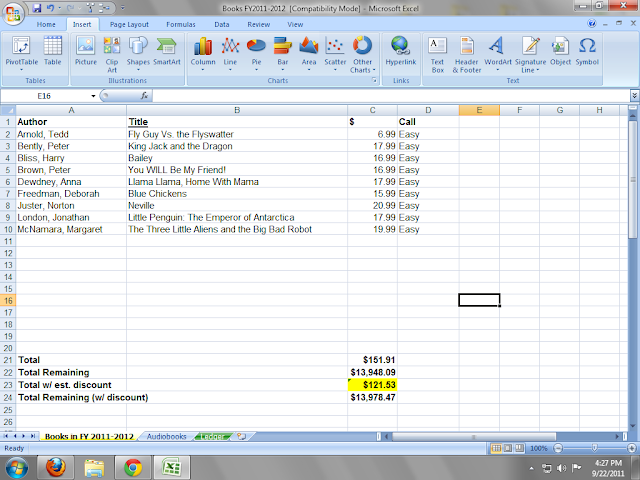 So, for example, approximately $6,000 on picture books and just under $3,000 on nonfiction and fiction. These are just broad goals. As you develop your collection, you will want to consider the strong and weak categories and reallocate funds appropriately. For example, this year I focused on strengthening our weak nonfiction selection (weeding and acquiring) while taking some funds away from our well-stocked picture books. You will want to rotate which collections you put the financial emphasis on from year to year. There are two main ways we order books at my library. We occasionally meet with direct sales reps and we also order directly through a book distribution vendor. With sales reps, I tend to purchase many nonfiction sets, as well as some picture books and easy readers (almost exclusively media tie-ins like SpongeBob, etc.). The media tie-ins are not usually reviewed in the major journals, so this is how I keep our collection up to date with new titles. The vast majority of my books are ordered through our book distribution vendor. There are several different companies. Major ones include Baker & Taylor and BWI. I used B&T at a previous library, but my current library uses a Michigan-based company, Emery Pratt. Basically, you search for titles, ISBNs, or authors you are interested in and create a cart (or many carts!). When your order is ready, you can submit it. If you've never acquired library books, the process is very similar to online shopping with the advantage that you are not spending your own money. And you're most likely spending hundreds to thousands of dollars on one order. They are so many great books out there! How do I stick to a budget? 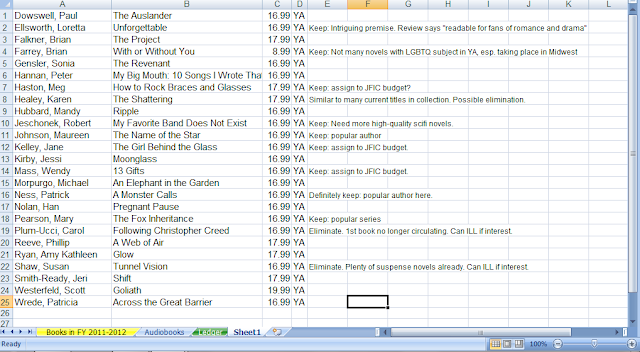 All ordered books go into spreadsheet containing the book's author, title, price per copy, and a guess at where it will most likely wind up being cataloged. Sometimes it is hard to tell from the review, particularly with 'tween books that might wind up in YA or chapter books once they get here. You will also want to keep in mind the average price of a book varies by category. School Library Journal tracks these numbers on a year to year basis. Total remaining: my annual budget - the total from Cell C21 = total in Cell C22. Total w/ est. discount. This is where things get tricky. Our library generally gets a percentage discount off the list price. How much it is totally at the mercy of our distributor. I usually assume we will pay anywhere from 80-90% of a list price. The spreadsheet is currently calculating at 80%, so the formula is C21 *.8 ad displays in C23 (the highlighted cell). 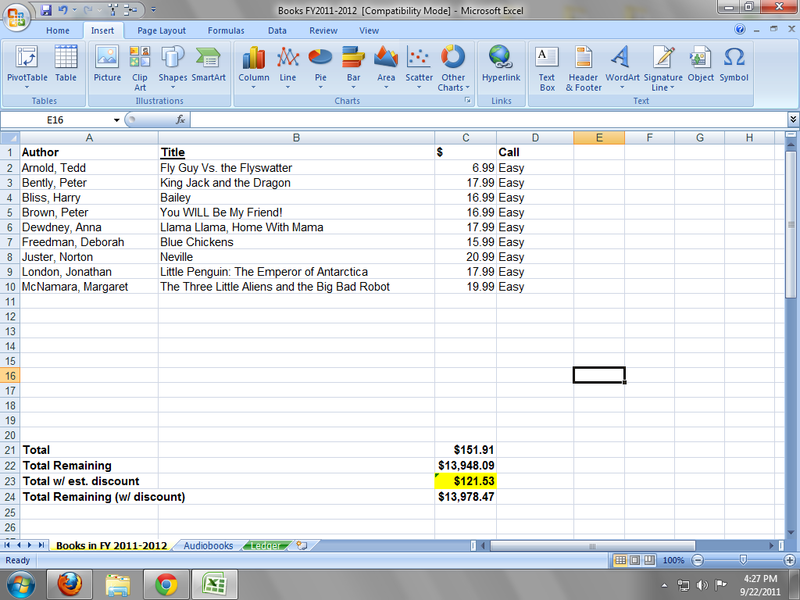 Total Remaining with discount: Subtracts the estimated discount from my annual budget and displays in C24. I am happy with the first pass but a little worried about some of my budgeting. We have way overspent in YA so now I am going to go back through and whittle out some titles. Currently I have 23 YA titles picked out and I should have about half that, so I go back to the reviews a little more carefully, which brings us to the next question. If you're on the fence about a particular book or need to cut lots of books, what factors are considered? The popularity of the genre in our community and/or whether it is well-represented in our collection already or not. Likelihood of availability through inter-library loan. Michigan has a statewide ILL program called MeL Cat. Many regional cooperatives also have a ILL option, although our cooperative does not. If the author is local or not. Local can be state-wide or within a few counties, depending on your library's definition and selection policy. Some libraries emphasize this more than others. How positive the review is. If it is just a generally positive review, we may or may not buy it. If it is a rave review from a trusted journal, that weighs heavily. Some journals have a reputation for being more critical than others. Starred reviews are not purchased automatically. How much of that category's monthly budget is being spent already. If I buy this book, will I have to remove another from my list? Which one is more important to our collection development? 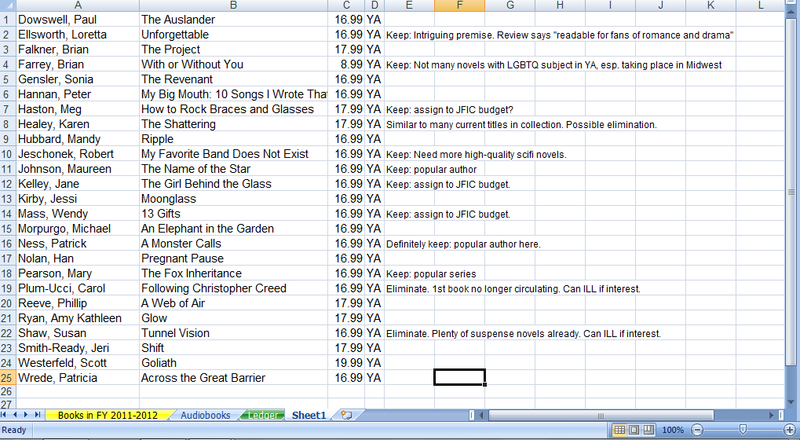 After rereading the reviews, I cut 3 YA books entirely and assigned 3 to the J budget. I also eliminated 2 nonfiction books after checking the Dewey sections and realizing that they are already well stocked. I'd like to stress that our not buying a book now doesn't make it a bad book. Another librarian might have cut the books I kept. We may even still end up buying some of these books later in the year if patrons request them! Overall, my verdict is: not great, but not bad. There are a lot of great books coming out this fall, but unfortunately there is only so much money to go around. 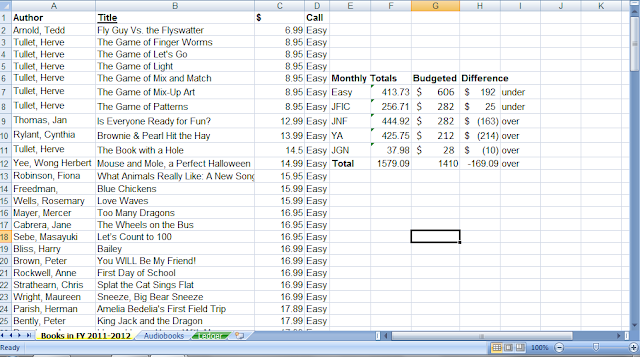 Now that we've cut some books, let's see how our budget looks now. Well, kind of a mixed bag success-wise. I stuck to my monthly budget overall, but some categories were much closer (J fiction and graphic novels) to the target than others (YA is still $110 over budget and JNF is $71 over as well, but that is balanced with the picture book budget being almost $200 under budget). Don't forget that we still have the unknown factor of discounts, which will most likely bring the total amount down into the $1200 range. In the end, I am happy that the total amount spent was close to what I anticipated and am not as worried about the individual categories. 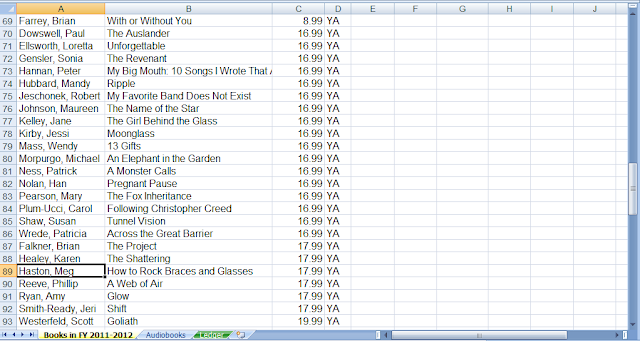 The thing about collection development is that some months certain categories of kids' books really outshine others. Maybe this is just the time of year for quality YA books, kind of like later in the year is Oscar bait season at the movies? 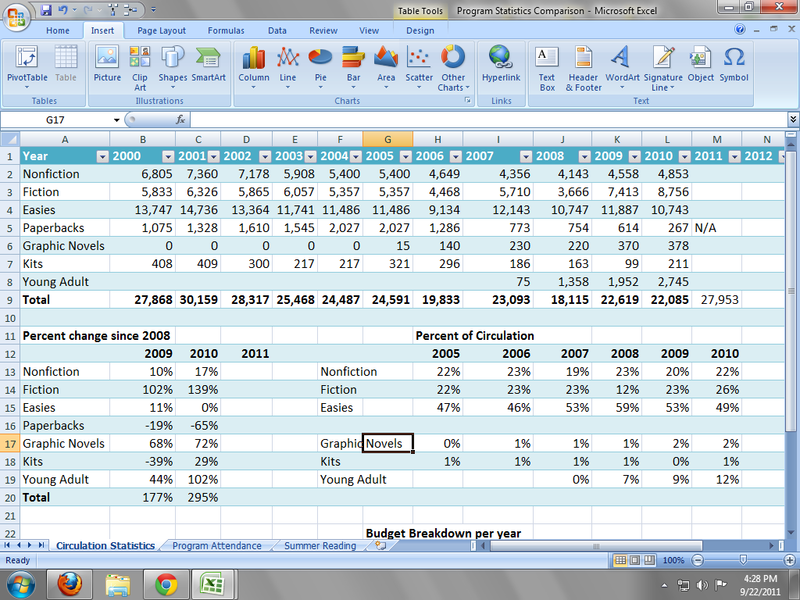 Perhaps I will do another budget breakdown later in the fiscal year and compare how I am doing. Let me know if you'd be interested. Now we're ready to actually order books! For books not purchased directly from sales reps, either I will place the order online or our secretary will call them. I prefer to place it online so I can see right away if we have already ordered the same item accidentally or not. The customer service reps will tell us over the phone if we have already ordered something as well though and ask if we want a 2nd copy or not. This is a LOT more organized than my approach! That's a great idea to look at which areas are circulating the most and distribute your budget money accordingly. I should really look at those reports myself. We, too, take patron requests very seriously and I almost always order them if they are available. Abby, it was really interesting for me to look at allocating the funds this way. I feel like it was the first time I really internalized how much of our circulation is picture books. I knew people left with stacks of 30 or 40 sometimes, but to see it as part of the bigger picture had eluded me. Really interested to see how these numbers change over the next few years. Great post! I am not new to juvenile collection development but it is always good to get a refresher based on ideas of what others are doing. I hope this encourages others to post about this too. Do you get an overall budget and then decide how to allocate it or do you get to decide what the actual budget is and allocate it too? We are told the budgets for Centrally listed books, paperback series and replacements and DVDs and we decide each much how much to spend. Michelle, good question! 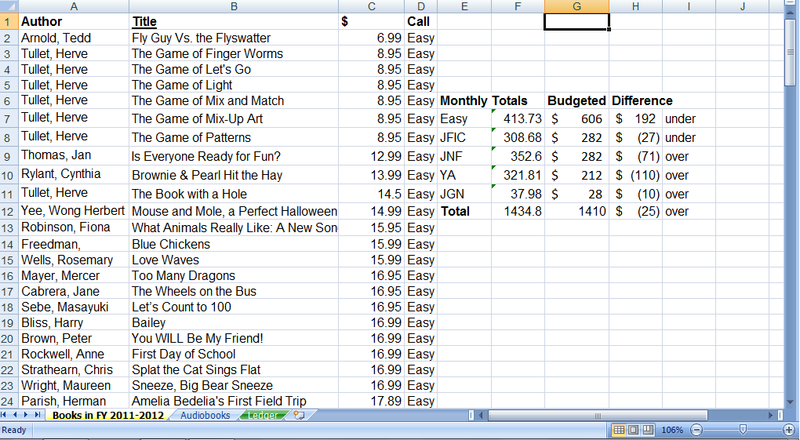 I am given a budget for the children's print collection at my branch. It is not divided in the budget how money should be allocated, but I wrote about how I decide how much money I want to spend for each area. We are a small library system (I work at the larger of our 2 branches) and we have no central selection, unless you want to count titles purchased for OverDrive. I hope other people post about this too. I know I would have loved to read some blog posts about this when I was starting out. Great post, Anne! It was just earlier today that I was wondering about how other librarians handle collection development (because I spent what seems like waay too much money on a book order). If I have time, I'll write a similar post in my blog, though I have to say that my collection development procedure isn't nearly as organized! Percentaging the budget was a great idea! I was able to show my director that yes, juvenile graphic novels and juvenile series (each only has one shelf) BOTH EQUAL the circulation of the entire juvenile fiction section. Don't know that it will change my budget, but it made me feel better!